With only a month or less left of summer, it’s time to think about getting ready for school. When thinking about getting back to school, ask yourself how you can optimize your child’s experience at school. Many issues from the last school year can be addressed in a preventive way. 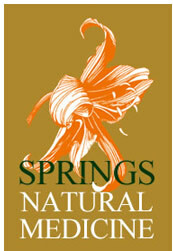 At Springs Natural Medicine we look at ways to make learning easier, naturally treating ADD/ADHD, anxiety and depression without medications and a program to boost immune health to cut down on sick days during the cold and flu season. According to the American Psychological Association, the following can signal that your child is experiencing stress and may not be able to recognize or verbalize it. Common changes can include acting irritable or moody, withdrawing from activities that used to give them pleasure, routinely expressing worries, complaining more than usual about school, crying, displaying surprising fearful reactions, clinging to a parent or teacher, sleeping too much or too little, or eating too much or too little. With teens, while spending more time with and confiding in peers is a normal part of growing up, significantly avoiding parents, abandoning long-time friendships for a new set of peers, or expressing excessive hostility toward family members, may indicate that the teen is experiencing significant stress. While negative behavior is not always linked to excessive stress, negative changes in behavior are almost always a clear indication that something is wrong. Children with ADD/ADHD may have behavioral issues and poor grades in school, while teens and adults may be forgetful and have difficulty keeping responsibilities organized. The root cause of such symptoms can vary greatly from inflammation(infections, food or environmental allergies, or hypersensitivities) to cranial bone misalignment and neurotransmitter imbalances. Evaluation of these underlying causes through blood and urine testing is very helpful in determining the cause of these behavioral issues, as well as help developing a treatment plan to address symptoms and the particular imbalances revealed by testing. The first step in developing an appropriate treatment plan is to determine the cause of the symptoms. Assessment of neurotransmitter levels though urine testing can provide valuable information about the status of the nervous system and its interaction with other systems in the body. The immune system can be evaluated in a number of ways to identify the presence and cause of inflammation or other root causes of anxiety. Once the biochemical imbalances contributing to anxiety are identified, a personalized treatment approach to depression can be undertaken. It is very common for people with depression to take antidepressant therapies recommended by their doctor. Commonly prescribed medications for depression work by altering brain signaling via neurotransmitter modulation. Assessment of neurotransmitters involved in depression can be helpful in determining if medication is necessary, selecting the best class of medication, tracking the medication’s effects if currently taking an anti-depressant, and determining the success of the medication. Change in appetite (either increase or decrease). Change in sleep patterns (either increase or decrease). Changes in activity level. The child either becomes more lethargic or more hyperactive. If you suspect your child or teen is dealing with any of these issues, please seek help. Contact us today to schedule an appointment to understand what is happening with your child and to test for specific causes and to create a specific natural plan to support both physical and mental health. There are many natural options to work with these conditions before the use of medications. Naturopathic doctors are also trained to know when pharmaceutical support is necessary and will make the recommendation to a qualified psychiatrist if needed.